Arkham studio Rocksteady is ramping up a "global marketing campaign for a very high profile, triple-A game franchise"
The Rocksteady rumour mill continues to churn out fresh info at a steady pace, though the studio behind the Batman: Arkham series has yet to offer any official insight into its latest project, beyond the fact that it's not a Superman game. However, fervent fans have discovered new job listings on Rocksteady's own website that implies the developer is getting ready for a big reveal, as all of them relate to positions related to marketing and promotional work. 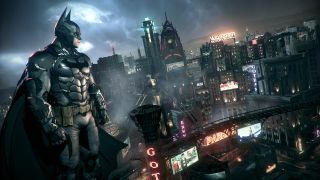 Batman: Arkham studio finally confirms one thing about its next game: "It's not Superman"
The concept of a "high profile, triple A game franchise" makes it sound like Rocksteady is almost definitely working on an established Warner Bros. IP, so another game set in the DC universe still isn't off the table outright. That said, the fact that the studio still needs to recruit, train, and integrate these potential hires into the process before they start working on fresh promotional materials suggests we're still a little ways off from the official reveal of Rocksteady's new game. I'm not going to pretend I know how long it takes to piece together a "global marketing campaign", but could we be seeing Rocksteady taking the stage at E3 2019 in June this year? As always, we've reached out to Warner Bros. Interactive Entertainment for comment, and will update the story if we hear anything more about this latest development. Batman: Arkham Knight tops our list of the best superhero games of all time, so we're confident that Rocksteady could pull off another Dark Knight adventure in the near future.